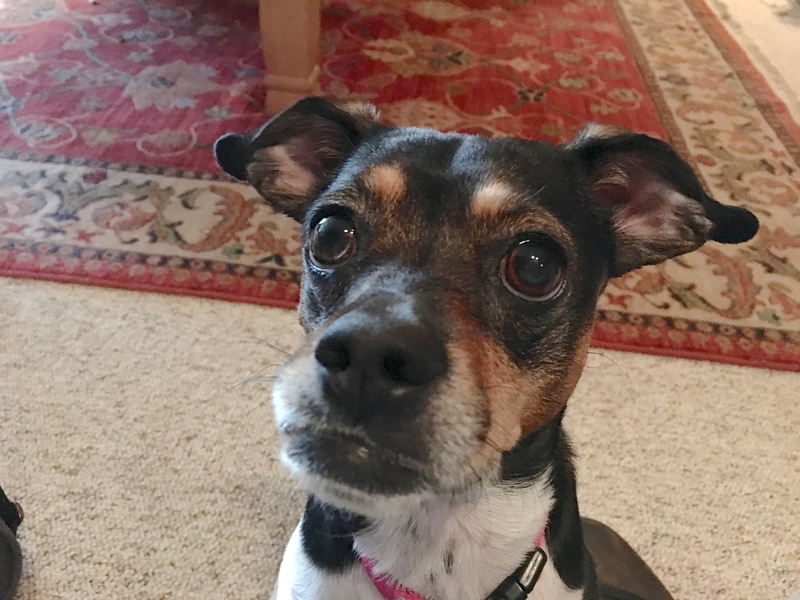 Itsy is a three-year-old female Rat Terrier who is very anxious, barks a lot, jumps up on people and has accidents in the house. Her guardian is a dog trainer but hadn’t been able to address these behavioral problems so she asked me to help put a stop to the dog’s anxiety and laundry list of behavior issues. I got a pretty good indication about Itsy’s issues and the reason they have become so intense moments after arriving for the session. As I mentioned in the above video, each time that Itsy’s guardians petted her to try to calm her down when she was in the middle of one of these barking outburst, they were actually reinforcing the dog’s unbalanced state of mind. When I sat down with her guardians to discuss the situation Itsy showed a number of signs of anxiety; she barked and then ran away, she tried to hide underneath the table, she ran around the room (including jumping up on the couch and humans), she carried herself with a crouched down or hunched-over body position with her ears back in the inside of the ears facing forward. Clearly Itsy was under stress and as I chatted with her guardians, it became apparent that a lack of structure and discipline had nurtured and enhanced this unbalanced behavior. It’s common for humans to think that removing all rules and limits is a great way to help a nervous dog relax. But in fact the lack of rules and structure tells the dog that it is in a position of authority, and with authority comes steps, especially if the people around her don’t act like one of her followers. This can lead to frustration and even more stress, the exact opposite of what Itsy needs. Its absolutely believed that she had the same rank and authority as her humans, perhaps even more. So when I pulled out my camera to film her activity and she disagreed, she thought she was entitled to correct me and disagree with my actions. By incorporating clear rules, boundaries and structure, Itsy’s guardians can actually help the dog feel more secure because she will start to identify as being in a follower position. There is far less stress involved when you are not the boss. Once she no longer feels like an authority figure, she will be less reactive and confrontational to people moving around or doing things she currently thinks she can control. In time, the frustration that she felt each time people didn’t comply with her disagreement will cease which will also help her calm down and relax. Because Itsy was reacting so strongly to the presence of my phone, I spent the next few minutes going over a counter conditioning technique to help the dog build up a positive association of someone holding a phone. Itsy’s guardians can apply this same counterconditioning technique to any situation or stimulus that she reacts negatively to; dogs in the park, people getting up in the house, bicycles, etc. Because Itsy’s guardians had been nurturing her unbalanced state by petting her when she was anxious, fearful or nervous, I spent the next few minutes going over a technique that I have developed called Petting with a purpose. By asking the dog to assume a more subordinate position and do something prior to receiving affection, her guardians will help the dog transition into a followers mindset even more. This will also help her learn to sit without trying to crouch down or lay in a submissive position as she was used to doing. While I always like to start out using positive reinforcement, sometimes a dog needs to understand that you disagree with them. To help her guardians communicate this more effectively, I spent the next few minutes going over a set of escalating consequences that I like to incorporate whenever a dog is breaking the rules. It’s going to be important for its these guardians to consistently enforce the new rules and disagree with her whenever she breaks them, while simultaneously rewarding her for engaging in any desired action or behavior. If they are consistent and apply each with good timing, the dog will learn what to do to get praise and stop doing things that result in a consequence. I also recommended that the guardian teach Itsy some new commands and tricks. Just like humans, dogs feel a sense of pride when they master a new skill. Teaching Itsy some new tricks will be easy for her guardian as she is a dog trainer, and this will help the dog’s self-esteem greatly. By the end of the session Itsy was much calmer and was starting to carry herself with a little bit more confidence. At first when I tried to pet her, she would instantly cower down or roll over onto her back. But as I finished up the session I was able to pet her while she remained in a sitting position with her nose up and no hunching over. This may seem like a little thing, but confidence is a powerful tribute and it will go a long ways for this dog. Now that her guardians know how to stop nurturing her anxious and unbalanced state, they will be able to provide Itsy with the framework that she needs to become more settled and defer to the humans rather than trying to control every situation herself.